Jacquie Ottman was named this past week one of 30 "Top Waste Influencers" by BeWastewise, a not for profit dedicated to providing a forum for discussing positive solutions to waste prevention. A wastehater from birth (or at least age 4), Jacquie is delighted with this recognition of her work founding WeHateToWaste.com - and hopes she can influence you to join our community. Jacquie Ottman shares her perspective on why green marketing claims are so challenging to get right -- and puts the gDiaper FTC challenges into context. Jacquie Ottman shares five strategies for gaining credibility with consumers, adapted from the report she recently co-authored with David Mallen entitled "How to Make Credible Green Marketing Claims What Marketers Need to Know about the Updated FTC Green Guides." It was published by Ad Age in September 2013. Link here to learn more about the report. TriplePundit.com interviews Jacquie Ottman about her ground-breaking new initiative, WeHateToWaste.com. Link here to read her story and see a fab picture of the treasure she recent scavenged from a NYC street corner. ConsciousConnectionMagazine.com founder Anthony Chiaravallo interviews Jacquie Ottman about WeHateToWaste.com. In the interview Jacquie describes the mission of We Hate To Waste and her plans to work with like-minded brands and businesses, to help all consumers waste less and leverage access to her global community of ardent waste haters for market research, crowdsourcing, and market activation. 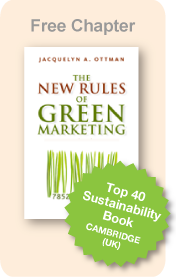 To save 10% off on Jacquelyn Ottman and David Mallen's new Ad Age Report, "How to Make Credible Green Marketing Claims: What Marketers Need to Know about the Updated FTC Green Guides", enter the code RR10J during checkout. This article from the Green Business Network provides an overview of Jacquie's newly released Ad Age report, “How to Make Credible Green Marketing Claims: What Marketers Need to Know about the Updated FTC Green Guides", which was co-authored by David Mallen. Eric Justian of TriplePundit.com discusses greenwashing and how Jacquelyn Ottman and David Mallen's recently published report, "How to Make Credible Green Marketing Claims: What Marketers Need to Know about the Updated FTC Green Guides", can help in reducing false green advertising claims. Christopher Zara writes about Jacquelyn Ottman and her new Ad Age report, "How to Make Credible Green Marketing Claims: What Marketers Need to Know About the Updated FTC Green Guides", co-authored by David Mallen. Ottman and Mallen's report summarizes the implications of the 2012 FTC Green Guides for Environmental Marketing for marketers.